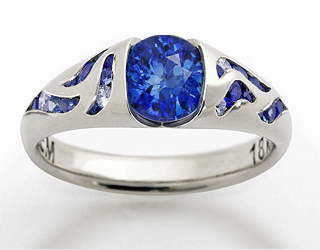 18k white gold, small precision cut blue sapphires, diamonds, 1.20 cts precision cut blue sapphire. I hear many beautiful love stories from my clients, some of my favorites involve the sea: the marine biologist who proposed with an underwater writing slate whilst diving coral reefs with his partner; a proposal on a tropical island beach under the stars; the man who spent a year at sea circumnavigating the world and proposed to his girl when his boat sailed in. For those watery love stories, I designed this wave ring. Shown here with blue sapphires and diamonds. Platinum, 18k Yellow gold, Sapphires. Rob and Rachel had a wonderful first date, but they met just as Rachel was about to fly to the UK for months away. However, as Rob writes.... "the Icelandic Volcano errupted, planes were unable to fly and her trip was canceled. We saw each other many times during the time she would have been traveling; in a very real way that volcano made the relationship happen." Inspired by Rob's wonderful story, I designed and made Rachel's volcano ring, in celebration of the firey serendipity that brought them together. Argentium™ Silver, synthetic ruby balls. I was delighted to win my third Saul Bell Design Award with this Argentium Silver bangle which won second place in the silver category this year. This design was born after my reading of the Large Hadron Collider and the race to find the 'God Particle' or Higgs Boson. After weeks of research and scores of CAD drawings the Collider bangle emerged. 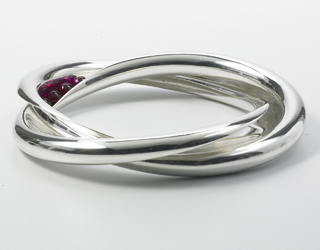 The bangle looks like two intertwined forms but it is actually one continuous channel with a single edge. Inside, synthetic ruby balls race around the channel and collide with each other.